The 3 Gives: You Spoke. We Listened. 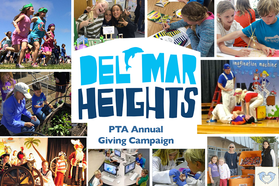 ﻿Our PTA surveys consistently show that Del Mar Heights parents prefer to donate through a giving campaign instead of having smaller fundraisers held throughout the year. As a result, we have reorganized our fundraising strategy around The 3 Gives or three "asks" during the school year. The beginning of the school year is full of hope and promise. It also marks the beginning of the Annual Giving Campaign. The campaign lasts five weeks and culminates with the Fall Harvest Festival. We hope that you will consider giving at the Dolphin level or above, but appreciate contributions of any amount! Every dollar counts! Our students showcase their athletic ability and school spirit by running laps, enlisting sponsors to fund their efforts. Each lap raises money for the DMSEF, which helps fund the salaries of STEAM+ teachers at all 8 DMUSD schools. ​Set up your own Jog-a-Thon page to email friends and family for donations and to send personalized “Thank You” notes to those who pledged. Each spring, the Del Mar and greater San Diego communities support our children by donating items to be auctioned off at a fun nighttime event. It is a memorable evening of music, dinner, dancing, socializing, and fundraising you won't want to miss! ​Proceeds support all of the programs and events that make Del Mar Heights special. Save the date!